I think today’s Real Party would be absolutely perfect for Fall. Spending a cool, crisp evening outside around a bonfire, roasting marshmallows, drinking red wine and toasting the good things in our lives. You could celebrate an engagement, a new house, a baby on the way or just about any special occasion. Sounds like a wonderful Fall night, right? 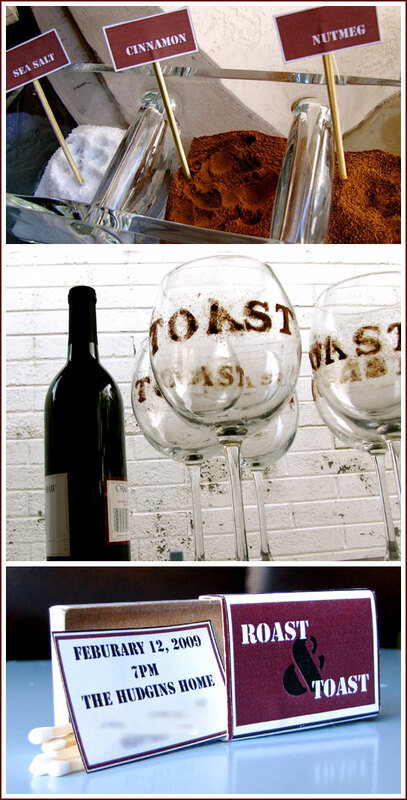 So let’s take a look at this unique Toast & Roast party, created by Vicky Hudgins of The City Cradle. This party is all about the little details. The matchbox invitations set the roasting theme from the very beginning. A gourmet s’mores bar included homemade marshmallows, fruit, and spices including sea salt. And how cool are those wine glasses? Vicky etched the word ‘Toast’ onto the wine glasses with cinnamon. Coffee drinkers were offered mugs rimmed with chocolate and graham cracker crumbs. I love how the theme is carried out throughout the party! This looks like my kind of party. Thank you to Vicky for the charming party inspiration and for reading Half Baked. You can see more of this party here on The City Cradle. So fun! I love all the details. This would be perfect for fall. Love the idea of roasting marshmallows and drinking wine! I love the idea of using spices in the s’mores… definitely takes it up a notch! I love this setup. I wish I did that for my wedding. Anna – so glad you were inspired by this lovely event! Looks like you had an amazing time! Congrats on your engagement and best wishes on the wedding planning! Hopefully we can help you find the perfect cake inspiration for your big day! I love this idea. This is a brilliant and creative idea. I noticed on this site I am learning a lot about what I can do in future. Another beautiful idea I will keep in mind. Thank you for sharing this, I am enjoying learning about different ideas I can do!